Does the question “Is tomato a fruit or a vegetable?” still leave you head-scratching? Oxford says a tomato is developed from the ovary in the base of the flower and contains the seeds of the plant, making it a fruit, scientifically speaking. On the other hand, Britannica declares it as both vegetable and fruit, botanically speaking. Tomatoes contain key carotenoids like lutein and lycopene that promote good eyesight; vitamin C, beta carotene and other antioxidants which decrease the chance of developing heart disease, diabetes and cancer; fiber that promotes good metabolism; potassium, choline and folate, reducing risks of heart attacks; and collagen for healthy skin and hair. 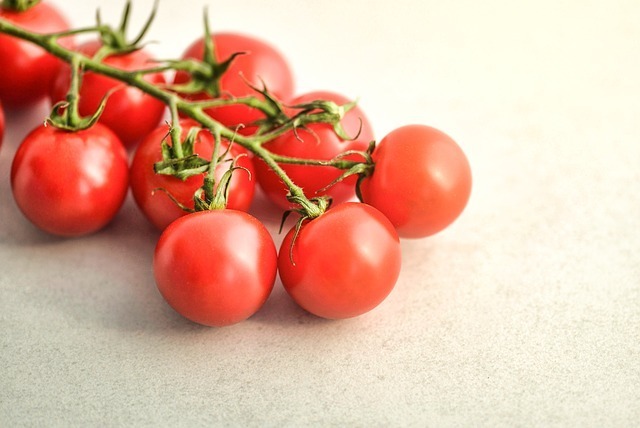 Tomatoes come in many different types, like the standard kind which is the globe or round tomatoes, heirloom, Roma, pear or San Marzano, and the cutest one which is the cherry tomato. These may vary in shapes and colors but all are equally nutritious whether eaten cooked or raw. And when you’re putting together a healthy vegetarian diet plan, these flavorful tomato recipes will surely get you craving more. This is a simple and easy to cook recipe. All you have to do is sauté lots of minced garlic, white onions and red ripe heirloom tomatoes in olive oil and simmer until it becomes thick and saucy. Pour in the spaghetti and minced bell peppers, and season with salt and pepper. Take off from heat and sprinkle with parmesan cheese. This recipe will not give you the heavy, bloated feeling after eating, unlike many other pasta dishes. This is a 3-step sandwich preparation which kicks off by spreading mustard on slices of rye bread, topping it with beefsteak tomato and cheese, and pan-frying until the bread is brown and the cheese has melted. This sandwich will bring out the tastiest fusion of flavors of tomato and cheese without any meat topping like ham or bacon. All you have to do is blend 2 cups of water, tomatoes, lemon juice and honey until smooth. Pour into a half gallon of water and refrigerate for an hour and you’ll surely have the most refreshing tomato juice. Grab a glass or two any time of the day and you’ll understand why passengers of one airline complained when the most in-demand tomato juice was removed from their beverage menu. Want some salsa for your chips? Sauté minced garlic, red onions and lots of San Marzano tomatoes in olive oil until crushed and thick, sprinkle salt, pepper and a pinch of sugar to balance the taste, then add minced jalapeños. This is a perfect salsa for fish and chips, or spread on a grilled whole wheat bread with mozzarella cheese. Some nutritionists even recommend eating raw tomatoes to keep the enzymes and beneficial compounds intact which may be lost during the cooking processes. Whatever you may call it, tomatoes are one of the best sources of nutrition for the body, inside and out. Thanks, dear for sharing such beautiful information with us. But here I have a very quick question that How we can realize our The Health Benefits of Tomatoes ? Hope soon you will write a detailed article to give a complete info about my question.